BROOKLYN, N.Y. – April 4, 2019 –Tough Mudder, the global fitness and active lifestyle brand, is kicking off its 2019 season with this weekend’s Tough Mudder Los Angeles, which promises to be bigger and bolder than ever. The Los Angeles event is the first of more than 130 events that Tough Mudder will host this year as it vaults into its tenth season. Tough Mudder Los Angeles will take place on April 6-7 at Glen Helen Raceway in San Bernardino, California, boasting thigh-burning hills and scenic vistas guaranteed to captivate participants. Debuting at Tough Mudder Los Angeles will be the event series’ new 5K event, which crams 13 unique obstacles into a shorter distance than the original Tough Mudder Classic, and will be a staple of Tough Mudder events going forward. The teamwork-focused 5K is in an untimed format, offering participants a unique, collaborative experience without demanding training leading up to the event. The 5K joins the Tough Mudder Classic, an 8-10-mile loop of mud-soaked mayhem with 25 best-in-class obstacles, and the Mini Mudder, a mile-long obstacle course specifically designed for adventure-seeking children. Coupled with a revamped Mudder Village Festival featuring local food, cold beer, live entertainment, lawn games, giveaways and more, the events provide a day of fun for the whole family. 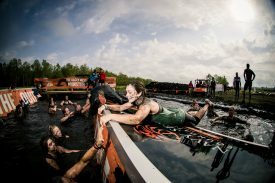 Tough Mudder has a larger and more powerful roster of brand partners than ever before, providing a uniquely fun experience for participants. Brands like Chipotle, Nexcare, Soap & Glory and CELSIUS are returning and new partners such as Navy Federal Credit Union, MuscleTech, Everyman Jack, Alanic and Ace are first time Tough Mudder partners, revamping the Mudder Village Festival and offering more than ever before. The Gauntlet – Clocking in at over 100 feet long, The Gauntlet is the longest Tough Mudder obstacle built to-date, with four iconic sections testing everything from balance and agility to core and grip strength. Mudderhorn – The tallest obstacle to be featured on a Tough Mudder course, the vertigo-inducing Mudderhorn pushes participants up and over a 25-foot high rope ladder. Black Widow – A series of 30-foot elevated tightropes leads participants over water pools, challenging participants to stay nimble while traversing the weaved web. Founded in 2010 with the launch of the Tough Mudder obstacle course event series, Tough Mudder Inc. has become a leading global sports and active lifestyle brand. With more than 3 million participants, the company hosts more than 130 non-competitive (Mini Mudder, Tough Mudder 5K and Tough Mudder Classic) and competitive (Tougher Mudder, Toughest Mudder and World’s Toughest Mudder) events annually in 10 countries including the United States, Canada, United Kingdom and Germany. The company’s content arm provides the more than millions of engaged online brand enthusiasts with fitness, nutrition and wellness content delivered daily across social and digital platforms. Other NAM sponsorship partners include 3M’s Nexcare and ACE brands, CELSIUS, Soap & Glory, EveryManJack, Navy Federal Credit Union, Alanic, Chipotle, MuscleTech and Viewsport. UK and Germany partners include Lucozade Sport, Brewdog, Snickers Protein, Toyo Tyres, Black Tower Wine, Rawbite, and Strandgut. For more information visit www.toughmudder.com.